He replied: "No. "He was then asked: "Did you try to kill your children? "He again replied: "No." 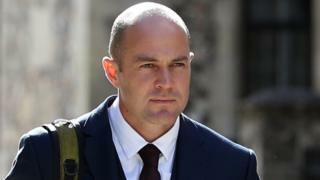 The jury has already heard that Mr Cilliers had been having an affair with another woman in the months before the parachute failed during a jump over Netheravon airfield in Wiltshire.Mr Cilliers is also accused of trying to murder his wife a week before the fall by tampering with a gas fixture at their home in Amesbury.In his interview, Mr Cilliers said traces of his blood found on the fixture may have been from when he tried to fix it. He said he tried to release a nut on the pipe, but could not manage it.He denies two counts of attempted murder and one of recklessly endangering life.The trial continues.